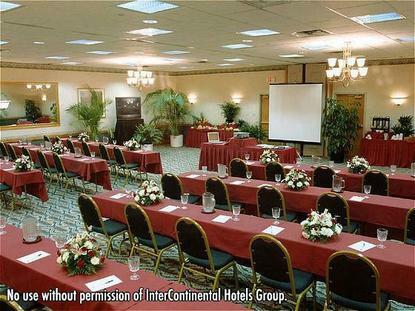 Welcome to the Holiday Inn Itasca where our corporate atmosphere makes comfort and convenience our top priority. Situated 8 miles from O'Hare International Airport and 4 miles from Schaumburg Airport, the Holiday Inn Itasca is ideally located where Dupage and Cook counties meet. The Schaumburg area, home to Woodfield Mall and many fine shopping venues and restaurants, is located minutes away. We are pleased to offer pre-arranged complimentary local shuttle service within a five mile radius Monday through Friday. The Holiday Inn Itasca will help maintain your exercise regimen in both our fitness center and year round indoor pool. After your workout, relax in our whirlpool or sauna. The Marketplace Restaurant serves breakfast, lunch and dinner daily as well as in-room dining. The Player's Court Lounge is ideal to unwind with our nightly drink specials. Our event space and outstanding service makes the Holiday Inn Itasca a great place to meet. With the help of our Holiday Inn Meetings Director, every detail of your event is our number one priority, making us the favorite for weddings, conferences, banquets, military and family reunions and convention planners. Attractions near hotel include the Schaumburg Flyers, Medieval Times, Medinah Golf Course, and Dave and Busters. Relax, it's Holiday Inn. Kids Stay & Eat Free. This hotel is committed to providing accessible facilities under the American Disabilities Act. If your accessibility needs are not met, please contact the Hotel Manager on Duty. Should you require additional information regarding accessible facilities for guests with disabilities, please call 1-800-Holiday (U.S. and Canada) or contact the hotel directly. For the hearing impaired, TDD service is available at 1-800-238-5544 within the U.S. and Canada.